Lamia, from The Poetical Works of John Keats (1884). 'Tis "the witching time of night"
Hush, hush! tread softly! hush, hush my dear! "Keats, John," in Dictionary of National Biography, London: Smith, Elder, & Co., (1885–1900) in 63 vols. Adonaïs, by Percy Bysshe Shelley (1821). 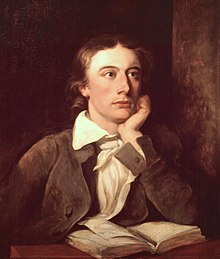 For the Anniversary of John Keats' Death, by Sara Teasdale (23 February 1821). "On the Promise of Keats", by George Edward Woodberry from Studies in letters and life (1890). This page was last edited on 4 May 2018, at 20:16.